Merrill & Ring "2 Spot" (wood burning) pushing drag out on dump. 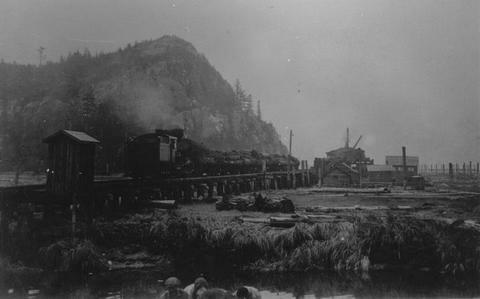 Charlie Calchan Engineer Boom Camp & Wood Yard. Comments by Ed Alridge: Note wood all gone off tender. Will wood up at wood yard before leaving. Steel gang unload steel of scow - at gridion in foreground.